Imagine you are a plant. You sit all day, not going anywhere, just growing and changing. You make a flower and eventually some seeds. Then you realize that if you simply drop those seeds in your shade, they won’t be able to grow. How are you going to get your seeds to someplace where they can thrive? You can throw them, but it is really hard without arms (although some plants can shoot their seeds away). You can make a sail or parachute and send them off in the wind, but only if you are in an open spot or if you are tall and the wind can catch them. You can make a fleshy fruit around your seeds so birds and mammals will take them away and eat them, but sometimes there isn’t enough water to make a juicy fruit. What do you do if you are a low plant, a small unnoticed plant, or if you live in the desert and you don’t have a lot of water? Then you might want to encourage ants to take your seeds. Wait, don’t ants eat seeds? Yes, some harvester ants specialize in collecting and eating seeds. But far more species of ants and plants have developed a civil system of reward for effort that benefits both the plants and the ants. The seeds of these plants have a special structure on them that is particularly yummy to ants. You could think of it as an ant potato chip, although the technical name is “elaiosome” which means oily, edible thing. Wait, doesn’t that describe a potato chip too? 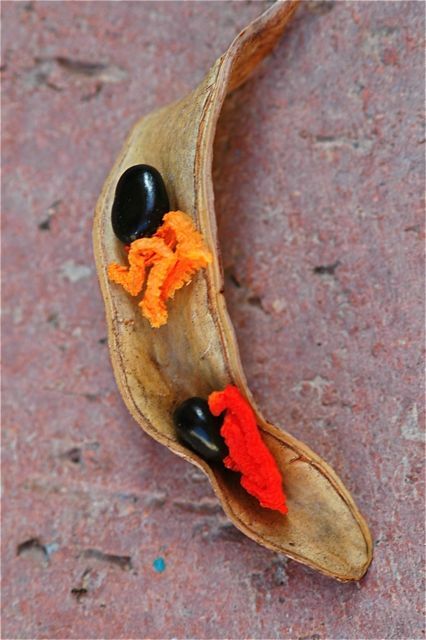 These are acacia seeds in an open pod. The orange and red parts are elaiosomes. Ants collect the seeds provided by the plant, carry them back to their nest, strip off the elaiosome/potato chip part, eat that and discard the still-intact seed into their garbage heap, a nutrient-rich pile of well-aerated soil. The seeds germinate, sending out new little plants that grow and thrive. Why don’t the ants just continue eating the seed after they’ve removed the elaiosome? Because most seeds with these structures are especially hard and/or slippery so they are just not that easy to eat. Sound like science fiction? Scientists have found these structures on the seeds of about a third of the plant species, everything from acacia trees to violets. But simply having the structures might not mean much. How do researchers know ants are important for planting seeds? Wildflowers were rapidly disappearing in one area of New England. The researchers knew pesticides had been sprayed on the forest to kill gypsy moth caterpillars. Did the pesticides kill the wildflowers? No, the answer was that the pesticides killed all the ants, and ants are vitally important for planting wildflowers, like violets and trillium. 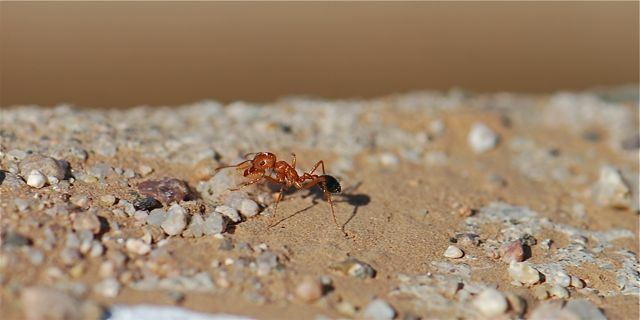 Besides providing a nice, well-aerated, moist and nutritious place for seeds to grow, ants may also be protecting seeds from rodents and other seed predators. Ant-planted seeds with elaiosomes are most common in areas with frequent wildfires. It makes sense the seeds would do better buried under the ground then exposed to the intense heat. Ant-planted seeds also do better in harsh climates, where the surface of the soil gets exceedingly hot. What about the harvester ants that eat seeds and not just the elaiosomes? It turns out even harvester ants drop or discard perfectly good seeds in places where the seeds can grow. Often a fringe of emerging seedlings surround harvester ant trash heaps. Humans have taken advantage of this seed-collecting behavior. In southern Africa the rooibos plant is used to make a tea, sometimes called “redbush” tea. Cultivation of the plant was difficult because the plant shoots out its seeds, making them nearly impossible for humans to gather. Farmers eventually discovered certain kinds of ants collect and store the seeds in their nests. They began gathering seeds from the ant nests and planting them successfully. 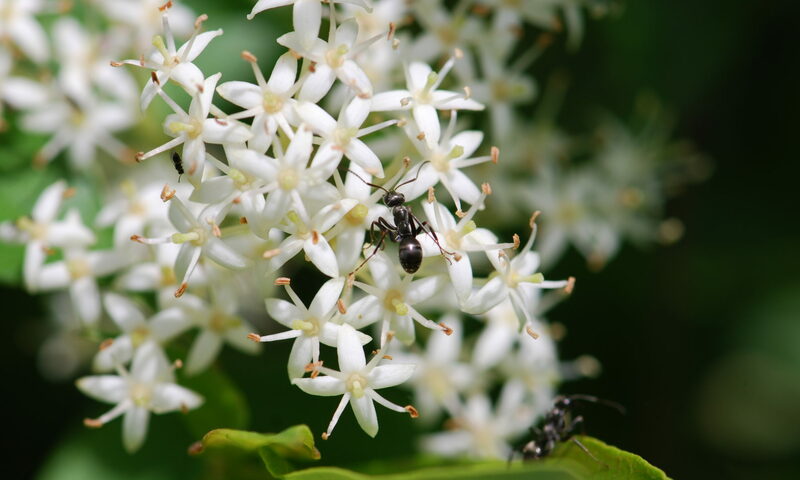 The bottom line is that ants are responsible for dispersing and planting thousands of species of plants, and we are learning more about these amazing relationships all the time. Have you ever seen ants gathering seeds? Did you know ants planted seeds? This post was prepared to accompany How Seeds get Around at Growing With Science blog. Gosh! Been away for too long (but for a good cause – working on my global revision of Polyergus). I just would add that for those of us living in the wooded eastern US, ant dispersal, especially by Aphaenogaster spp. apparently, is really important for the early spring flora, including lots of species in unrelate plant families such as memebers of the lily, poppy, violet, and sedge families. Thank you for this article! A young friend was surprised that I put an ant outside rather than “squoosh” it. I asked her to think about what the ant might be doing now that “it” had been saved. Our list was short, so I am delighted to have found this site and article about the usefulness of our ant creatures.